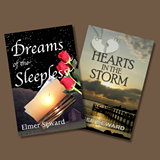 Dreams of the Sleepless – The name of the town that serves as the setting for the story was selected for a reason. The underlying concept is reinforced by an inscription on a headstone in the story. Molly’s name is actually a variant of another woman’s name. Hearts in the Storm – Although we see very little of Brody in the book, he is a pivotal character. His name actually has two meanings that apply in the story. Can you find a hidden reference to one of the meanings that ties him to another character? Not sure if you caught it, but Jimbo explains how he came up with the name of the cafe. It’s not just a bit of conversation that I threw in. It is significant to what is going on in the story. These are just a few examples. If you are a story nerd like I am, you may have fun discovering the others.